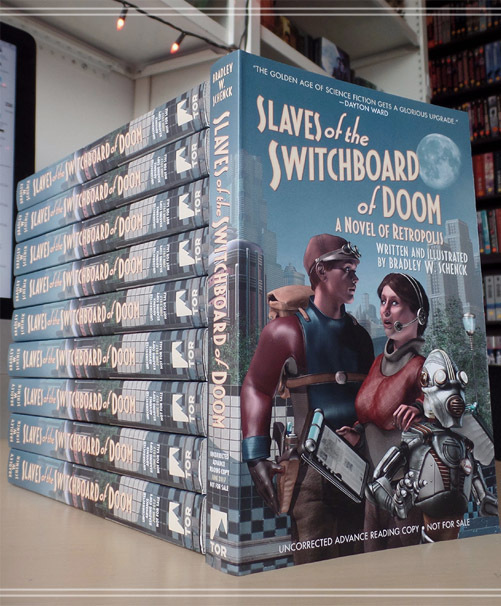 Having nearly completed their prolonged breeding program, these rare Advance Reading Copies of Slaves of the Switchboard of Doom are seen here, in New York’s historic Flatiron Building, as they await their release into their native habitat. It’s a happy day for the book’s well-wishers everywhere. At the same time we can’t forget that hunting season for these books looms just ahead: starting on June 13 anybody – with or without a hunting license – is authorized to capture the book at will. It’s hoped that these copies, slated for delivery to trade publications and reviewers, will help to promote the book’s ultimate success in what we hope will be a friendly, welcoming environment. For the first Wednesday in more than six months, there’s no update today for a story at Thrilling Tales of the Downright Unusual. And that’s not an accident: it’s all part of my nefarious plan for the Files of the Retropolis Registry of Patents. Yes, Mister Bond: you just sit there in those nearly unbreakable chains, and I will tell you everything. We’ve seen some major changes for Ben and Violet after the events of Professor Wilcox and the Floating Laboratory and Ben Bowman in the Vault of Terror. 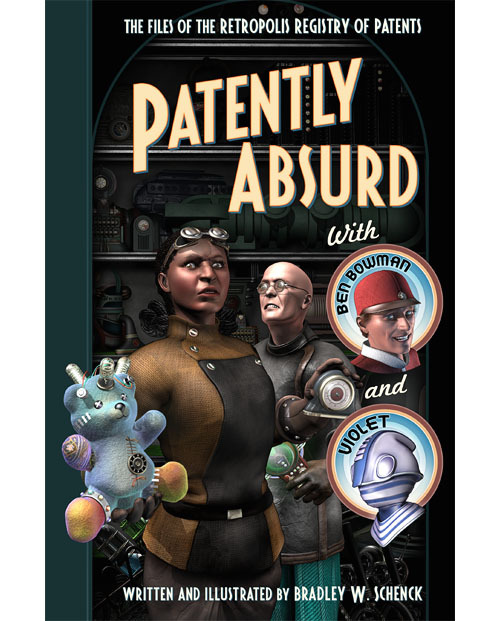 Those changes lead us into the conclusion of the series, which will appear for the first time in a collection called Patently Absurd. That will collect the entire series together in one illustrated book in print and digital formats. The launch for the book and its new imprint will be fueled by a Kickstarter project during the summer, following the release of Slaves of the Switchboard of Doom. I’ve had a lot of fun with this series of stories. They follow the everyday lives of ordinary people, both human and mechanical, in a place that’s extraordinary… to us. But it’s just home to them, of course. They take its mad science and its unique difficulties in stride because, at the end of the day, the thing that really interests and worries them is office politics. Like I said: ordinary people. My plan for the series has always been to collect it, and that’s the reason why the stories have departed from the format I set for The Lair of the Clockwork Book. There’s more text to go with each illustration, for one thing. That makes the print layout a lot simpler than it was for the earlier book. And the black-and-white illustrations for Patently Absurd, because they cost less to print, will make it possible for me to sell the book in more markets. So those of you who’ve been following the stories can look forward to their conclusion later this year or early in 2018. We won’t talk too much about Patently Absurd until after Slaves of the Switchboard of Doom is released. (That’s on June 13!) But it’s out there. Or it will be, anyway. Also, I’ve added preorder links for Slaves of the Switchboard of Doom in several places, like this one, even though the retailers’ cover thumbnails are (still) pretty awful. I continue to hope that we’ll get that straightened out.